I love the blast from the past posts. When it's something I recognize, it's very nostalgic, and when I don't, it's cool to see something "new". 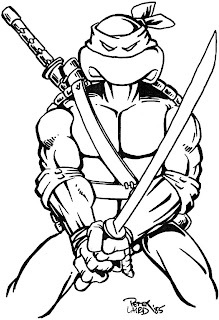 I guess the turtles would have looked more or less like this all the time in the beginning if it wasn't for the toning? those lines are very clean and i really dont mind the single belt on the chest. I think i could go for either style! -->> ..anyone know what issue this appeared in ? ? .. i guess i better go diggin'. Looks a lot like the NECA Leo to me.